A priest often leads the rosary at a Catholic wake. The rosary is a type of devotional prayer set that marks events in the life of Jesus and his mother Mary. 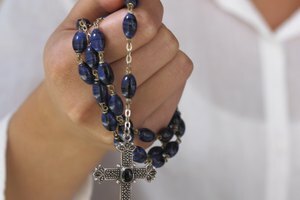 Pious Catholics pray the rosary daily and before the start of Mass. During the wake of a Catholic funeral, mourners also may recite the rosary, offering their prayer intentions to the deceased and his family. When a rosary is said, the faithful praying it meditate on one of the four Mysteries: Glorious, Joyful, Sorrowful or Luminous. At a wake, mourners might choose to meditate on the Sorrowful Mysteries, which reflect on the moments surrounding Jesus' death, or on the Glorious Mysteries, which recount the celebration of life after death. Wait for the priest or other designated person to begin the rosary. Make the Sign of the Cross with your right hand: Touch your forehead, middle of your chest, your left shoulder and then your right shoulder. 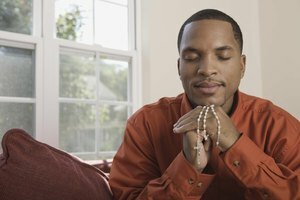 Hold your rosary in your non-dominant hand or fold your hands in prayer if you don't have a rosary. Pray the Apostles' Creed with the leader while holding the crucifix at the end of the rosary. Recite the second half of the introductory prayers after the leader prays the first half; these prayers include one Our Father (first bead after crucifix), three Hail Marys (next three beads) and one Glory Be (the space before the fourth bead). Meditate on whatever Mystery the leader has selected: the Sorrowful or Glorious Mysteries. Pray the second half of the Our Father on the fourth bead before the rosary's medallion. Recite the second half of each prayer as you go through each of the five decades of the rosary. 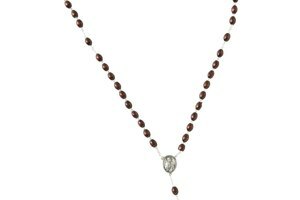 Pray 10 Hail Marys on each of the 10 beads. Finish each decade with one Glory Be and one Eternal Rest prayer, which are recited when you reach the space before the single bead, which is where you pray the Our Father. Meditate on each of the five individual Mysteries that are read before each Our Father. For example, the five individual Mysteries under the Sorrowful Mysteries include The Agony in the Garden, The Scourging at the Pillar, The Crowning of Thorns, The Carrying of the Cross and The Crucifixion. The five individual Mysteries within the Glorious Mysteries include The Resurrection, The Ascension, The Descent of the Holy Spirit, The Assumption and The Coronation. Conclude the rosary by praying the Hail Holy Queen with the leader. Make the Sign of the Cross after the leader indicates the rosary is completed. During a rosary at a funeral's wake, the Eternal Rest prayer replaces the Fatima Prayer. 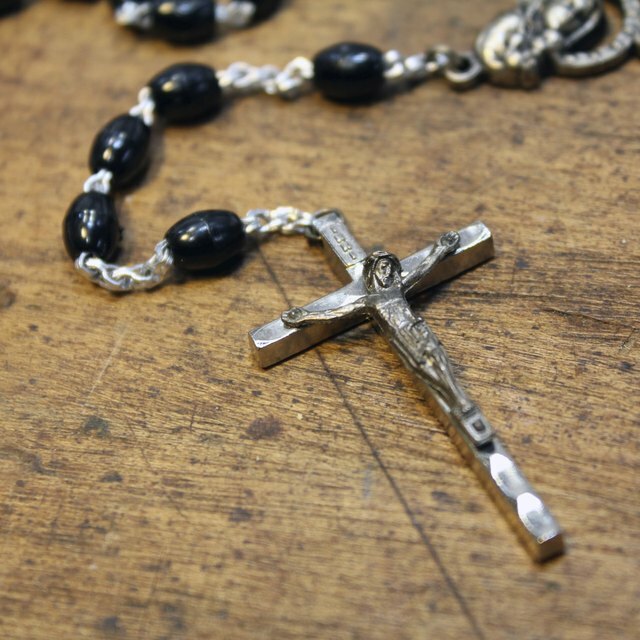 If you are unfamiliar with the rosary, whether you are Catholic or not, show respect during this portion of the wake by not talking with other mourners or causing a disruption. Pinto, Jennifer. 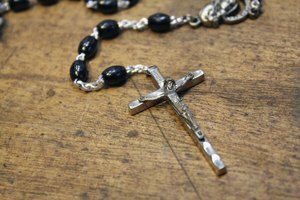 "How to Pray the Rosary Before a Funeral." 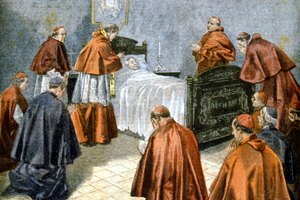 Synonym, https://classroom.synonym.com/how-to-pray-the-rosary-before-a-funeral-12085302.html. 29 September 2017.